Hartley has one rather vandalised (2006) nameplate at the bottom Hoselands Hill by the rail bridge, of a standard borough council issue. This is a successor to the first nameplates set up by Kent County Council in 1947. 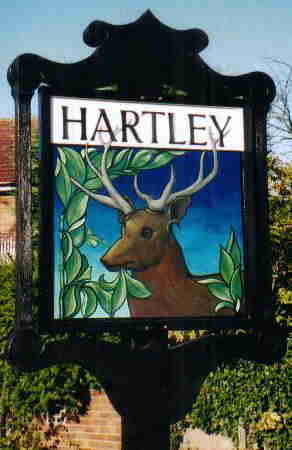 The main Hartley sign is a more local affair. In 1951 Miss Robertson of the Hartley Art Circle offered to design and pay for it. There then followed 18 months of correspondence before Kent County Council planners would approve it, and then it was only initially for 2 years under the Control of Advertisements Order! So in 1953 Hartley finally got its new sign, thanks to Miss Robertson and Mr Strutt, who was responsible for the woodwork. The original sign had to be repaired in 1968 and 1982 and was completely replaced in 1989 (click here for the artist's webpage). The new sign is of a very similar design, the Hart looks the same, but there is now more foliage and there is no longer the Kent invicta crest at the top of the board. There is a picture of the original in the Dartford Rural District Council Bulletin 18 of Summer 1953 (in Dartford Library).